Today I pulled the trigger on Top Dog Agility Players. I’m not really ready mind you. My data systems aren’t in place, which is surely a worry. But you should know I’ve waited patiently for a very long time now. I’ve researched it. I’ve refined it. I’m really looking forward to seeing who wants to come out and play. Frankly, I’d very much like to see clubs all around the world gradually come to compete in the TDAP. Imagine… running the same course as some person in South Africa, another in Norway, and yet another in Japan. The bit I really am antsy to get working is making field space available for individual competitors to link a YouTube along with their event results. So can you imagine… actually getting to see the person in South Africa, the other in Norway, and that one in Japan running the same course with their dogs that you run with yours? Imagine. This is a tutorial that is applicable to a variety of games that might be played in the TDAA. The sample happens to be a game called Tunnel Vision. I have presented below both the designer/judge’s course, and the briefing submitted for course review. I’ll have comments on each. My comments below will be written in blue. 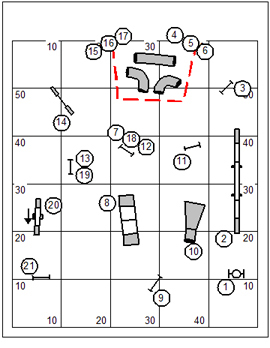 To be really fair about this course review, the designer has been given a game that is interesting, but rarely played. Part of our objective in the course review process is to give the rules of the game a good work-out and improve upon our understanding of play, as well as design. Tunnel Vision is the invention of Darlene Woz, one of the foremost innovators in the field of agility games development. This is the perfect game for clubs that are rich in pipe tunnels and want something really fun and really different to play. • All obstacles can be taken in either direction. • Each clump of tunnels may be performed in any order and in any direction, so long as each of the tunnels is ultimately performed. 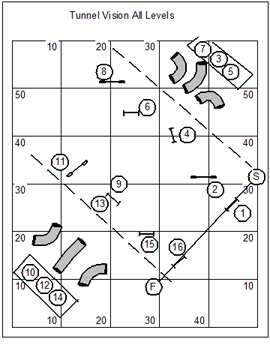 This could mean that the handler has to adapt his running strategy on the fly if the dog selects a tunnel other than the one intended by the handler. • The handler must remain behind the indicated containment line for each group of tunnels. 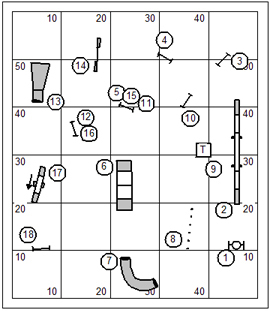 If the closing whistle hasn’t blown by the time the dog reaches the jackpot jump (#15 on the sample course), 100 points will be awarded. The dog may then attempt to complete the inner circle of obstacles (sans tunnel groups) for an additional 100 bonus points. As long as the whistle hasn’t blown by the start of the dog’s inner circle run, the turn may be completed although the dog will finish with some time faults. Tunnel Vision is scored points, minus Faults, Then Time. The winner is the dog with the highest score. 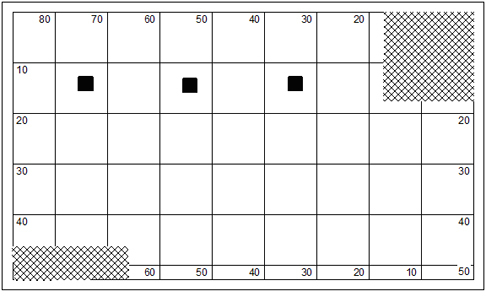 Any time faults (whole numbers) will be subtracted from the dog’s total score. Any time remaining on the clock (whole numbers) will be added to the dog’s total score. 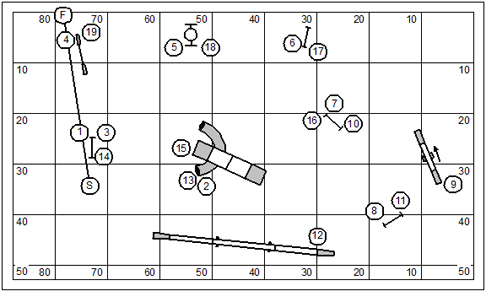 * What jumps out at me immediately about the course is that the course designer understands the game and contrived to lay out obstacles to suit the rules of the game. You’ll notice that the sequencing itself, outside of the approaches to the tunnel riddles, is completely contrived and uninteresting. That design is something of a copy of the design given as an example in the Book of Agility Games. * The most obvious down-side of the design is that it’s almost impossible to nest the design against anything else that might be played on the day. So it’ll cost you a minimum of a half an hour to tear down what was there and build the new course; and a minimum of a half an hour to tear down this one to build the next. You’ve cost everyone a full hour in the conduct of the trial. 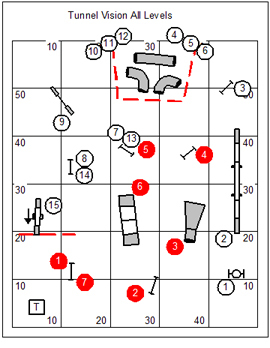 I went out on my computer and found a random course that I like. That course is right here. The course I found was on a different field size than the Tunnel Vision course that was submitted to me for review; so I tweaked it around a bit so that it fit. I did some tweaking of the course to give lots of room to approach the tunnel riddle; room to solve; and room to continue once it’s been done. Unfortunately this course doesn’t really serve as a good Tunnel Vision course. It’s too long; and we have to solve the riddle of the “inner circle” which is taken after the “jackpot” obstacle. So I’ve amended as illustrated below. You’ll note that I took several obstacles out of play in the white numbered sequence. 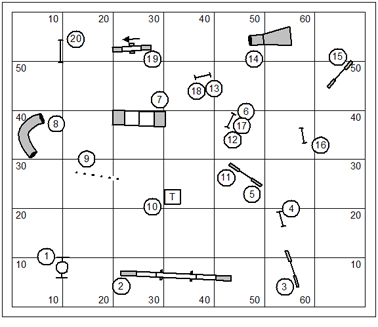 The original rules of the game leave the impression (intentionally or otherwise) that the dog should run the entire sequence again, sans tunnels. But I seized on the idea of “inner circle” and made a uniquely numbered sequence; so that the obstacles I took out of play are reincorporated into the game. You have to admit that this is a more interesting kind of sequence than the submitted course. 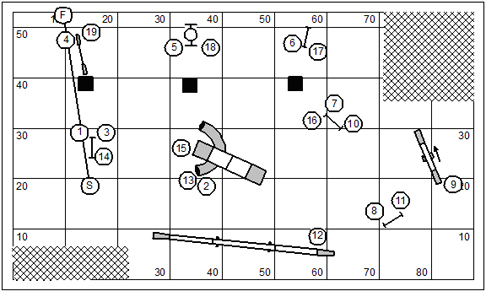 I’m aware that the example in the Book of Agility Games is based on a Jumpers sequence; and the silly writer of the description of the game said “Tunnel Vision is played on a course consisting of only pipe tunnels, jumps, and weave poles”. I think we can move away from that constraint. I’m going to gently rewrite the briefing, and discuss the changes I’ve made. • The “clump” of tunnels may be performed in any order and direction, so long as each of the tunnels is ultimately performed. • The handler must remain outside the indicated containment lines for each clump of tunnels. I rewrote the intro paragraph which establishes Tunnel Vision as a Jumpers course. This is a needless constraint. In the bullet list I took out the observation that things will get interesting if the dog chooses the order of tunnel performance, rather than the handler. The standard course time is based on a path measured by the judge using rates of travel comparable to the standard classes respective to jump height of each dog. The timekeeper will be instructed to blow a whistle at the end of time if the dog has not completed the Jackpot obstacle. I’ve changed the discussion of course times so that the example course times don’t become a codified requirement of the game. Also I have introduced the idea of the closing “whistle”. On this course the Jackpot obstacle is the teeter. If the plank has tipped and touched then it has been completed. The judges briefing should indicate which obstacle is the joker obstacle. A dog completing the Jackpot obstacle under time earns 100 bonus points. The dog may be directed to the table to stop time; or may be directed to complete the Inner Circle of obstacles for an additional 100 bonus points. As long as the whistle hasn’t blown by the start of the dog’s inner circle run, the turn may be completed although the dog may finish with some time faults. Tunnel Vision is scored Points, Less Faults, Plus Bonus, Then Time. The winner is the dog with the highest score. 1 fault for each full second over the course time. A one point performance bonus will be awarded for each full second under course time. I’ve removed from scoring the long list of possible performance faults; informing the exhibitor instead that we’ll just use the performance faults that we recognize in the standard classes. This allows the special faults recognized in this class to stand out. Note that it’s unusual for time to be a matter of faults and bonus. It is an important consideration in this game. As the handler finishes the Jackpot obstacle with his dog he has a choice of going to the table to grab additional bonus points, or go after the “inner circle” for bonus points. I’m not so sure our qualifying criteria makes great sense. It would be good to see 100 dogs run on the game; with 100 dogs just about everything that can happen, will happen. The Games 1 qualifying criteria was probably too lenient. If the dog has more than one performance fault on course, then he’d better be quick enough to earn bonus points for seconds under course time. Clearly, no dog who hears the time-keeper’s whistle will qualify. And just as clear, the inner circle is not an optional exercise for the G3 dog. I hope this discussion has helped! I came off of ten day of travel, work and play attending two TDAA Regional Petit Prix tournaments. I’ll turn my attention back to those tournaments early next week as we study our “Lessons Learned”; and begin planning for next year. Stay tuned eh? We returned the day before Election Day. You should know that Marsha and I have been busy and involved in this election. Of course we’ve donated money to President Obama’s election campaign and to the DNC. We’ve also made our house available as lodging for volunteers and as a center for telephone canvassing. So on Election Day we joined the troops on the ground for last minute door-to-door canvassing. For a few days I worked on chores. Chores have no compassion for or understanding of the “Busy Season”. I fixed the door to the chicken coop, for example. Today begins a Work Study Camp here at Country Dream. Five or six young ladies are here to help out with a couple big chores. They’ll work with me in the morning, and spend the afternoon in agility training. These young ladies by the way are the principal actors in an annual dog training camp at Country Dream called The 4H Teen Dog Experience… or something like that. We make facilities available at a very attractive price. And so they come back to us every year. I’m really looking forward to working with them. You know, my last editorial in the Clean Run Magazine before I sold my share off to Monica Percival was a statement of a dream that dog agility could be inexpensive and affordable enough for just about anybody who owns a dog. I think I’ve finally found the correct model. I’ve continued working at launching this very low-key recreational agility venue. Refer to my “blog space” for the venue at: http://topdogagilityplayers.wordpress.com/. The rules will be published soon. And frankly, even though I’m not completely ready to deal with data management I’ll likely launch the venue at the end of next week. You are currently browsing the Bud Houston's Blog blog archives for November, 2012.